Really excellent post, David. Your point on seignorage as essentially a payment for the services of running a reserve currency is a great one. It’s one we don’t remind our population of adequately. And unfortunately, when I’ve read pieces like the one in the Journal by those fixated on returning to gold, I’ve also found them pretty off-target, with explanations that don’t exhibit much understanding of the issues historically or currently. We have been willing to take current account deficits, which most other major countries constantly (and for reasons I and many other economists find partly irrational: they essentially prefer to produce more and give it to others in exchange for electronic entries) want not to have. Consider the number of major countries (start with Germany, and it has lots of company) that constantly want to run current account surpluses. Such behavior requires someone on the other side. The biggest someone has consistently been the U.S., for most of the last 35 years. And of course, the capital and current account surpluses offset: the U.S. gets inflows of foreign capital and has relatively few restrictions on it. I think in general that our willingness to take the current account deficits that few others take willingly is one of the reasons we remain the reserve currency issuer–and get compensated for it as you point out. We were the ones that got the point first that the world needed adequate liquidity during the Global Financial Crisis. (In fairness, the ECB did provide some. But as we know, the Eurozone also has embedded in its architecture a fiscal structure that was a disaster in coping with a severe recession, and remains so.) Acting as a lender of last resort is a valuable service that many other countries would not be willing to render–or wouldn’t be able to do while keeping inflation relatively low. The U.S. has had relatively open capital markets. Many others have not, at least at times when it suited them to restrict their openness. And the gold standard kept a degree of long-run stability by a very wasteful mechanism. Deflation raises the price of gold and thereby sends a price signal to produce more . . . and since we don’t use gold coins (they have long been far too valuable for day-to-day transactions) we mostly put the monetary gold back in the ground. The price of that stability is a large use of resources that does nothing but serve as a backing for money. If we can keep relative price stability without doing that, it’s a clear social gain. Fiat money is one the great social innovations of all time–and it goes back a long way. Figuring out how to control and use it has been a big benefit to us. WRT the status of the US dollar being the main reserve currency, what other state currency is large enough to run the requisite trade deficits necessary for foreigners to accumulate enough of said currency? Every major state currency nation(s) is\are doing their best to run trade surpluses in order to achieve the necessary aggregate demand to employ their domestic populations. Except for the USA (thankfully). now if only we could get the Govt to enact policies that supplement our aggregate demand, we’d be in good shape. Great post, David. I especially liked your point on seignorage as a payment for providing/managing a reserve currency that has incredible externalities. I find articles like the one you critiqued very frustrating as they don’t seem often to have a grasp of either the current or historical issues connected wit the gold standard. 1. Most major countries (start with Germany but there’s plenty of company) want to run current account surpluses. The world as a whole can’t. The U.S. has regularly, for most of the last 35 years, been the country willing to take the other side by running current account deficits. Would most countries like to make the euro the reserve currency? 2. The other part of the balance of payments equalities is that the current and capital accounts offset. We also have relatively open capital markets (some others do not) and allow foreigners to invest relatively easily in U.S. financial and real assets. Our current account deficits are offset by this investment, but some other countries are not so ready to allow a varied menu of investment options. 3. The U.S. was the lender of last resort in the Global Financial Crisis; the ECB did provide some liquidity but as we know, the Eurozone architecture with its fiscal deficit limits has been a major problem. U.S. willingness to take on the role it did is part of the reason we’re a reserve currency. I also find it useful to consider what Milton Friedman thought about the gold standard. In his book Money Mischief written in the early 1990s, he described the “almost surely negative” welfare effects of gold discoveries but went on to comment that “the world is now engaged in a great experiment to see if it can fashion a different [nominal] anchor [than gold], one that depends on government restraint rather than on the cost of acquiring a physical commodity.” He recognized the burden of a gold standard in terms of its cost–but that burden, he thought, might be necessary. I think of it as the paradox of the gold standard. The so-called long-term price stability of the gold standard (we had, of course, a long deflation followed by an inflation in the late 19th century) comes at a major cost: during a deflation, the market is sending a message that it’s worth more real resources per ounce to find and refine gold, and the market obliges. That eventually stops the deflation, but at a very significant resource cost. Fiat money costs very little but requires discipline. I’d love to see Lew Lehrman’s answer. Fiat money managed well enough to keep inflation at a reasonably low rate without the waste of resources of a commodity standard is one of our great social innovations, and it’s been used in a lot of situations for a long time. It’s not that irrational. Apparently it is more acceptable to ship real things that you have spent time to produce and create to other countries so that they will give you their currency that you can’t use in your country, which you then have to swap out in the banking system with your own currency, than it is to inject your own currency in the first place, run a state deficit and have a higher standard of living. The problem is net saving – which is permitted by the system and generally encouraged. Something has to offset that paradox of thrift. The push for net exports solves that problem in a way that those who are hard of accounting find acceptable. The smart country prepared to run constant accounting deficits and not worry about it automatically gets a higher standard of living in payment. See it as a service to those countries who believe a strange old-time religion. Germany being the biggest victim, although of course they have found a way of convincing a whole host of other countries to take the pain instead. I agree this is an excellent post, not least because the word “seigniorage” appears in it, but I must submit it’s economists who misunderstand the gold standard, probably because the gold standard is a matter of law, not economics. Basically the idea is a jubilee – decreed by law – followed by a return to a gold standard managed by the central bank in much the same way as the central bank now manages interest rates. The latter is a significant modification of my original thoughts on the subject (if that matters to anyone other than me), where I advocated abolishing the central bank. I think you are all quite wrong that a gold standard inevitably leads to deflation. There may be good social reasons to treat the dollar definition differently from other weights and measures, but renouncing redeemability entirely cannot help but lead to tyranny, as it has both in the US and elsewhere. Fundamentally, I think what is missing from your collective perspectives is the realization that the law has to govern, not economic theories. I appreciate that the legal profession has essentially abdicated to economists in that regard, but of course things don’t have to stay that way. And the claim that the dollar will remain the “reserve currency” for at least a millennium is very revealing. Many social conditions (war and revolution come immediately to mind) trump any kind of “economic policy”. Economic policy can be a tool of government, not the foundation of government itself. I suppose it’s not a coincidence that your views ultimately translate into the very high status and influence economists currently enjoy, but in the end the question is whether economists rule, or the rule of law governs them like everyone else. Nothing trumps natural law, and that’s what the gold standard is, and that’s in the final analysis why it is so bitterly opposed by economists. I would appreciate, by the way, any opinions anyone reading here would have on the proposal I have made for a jubilee/gold standard, the details of which are found through the previous links. Always good to consider other opinions. The evidence for a bubble in the 1920s is actually rather strong. The online Shiller data is a good starting point. The S&P Composite rose by almost 50% in the year before the crash (from 21.17 in 9/1928 to 31.30 in 9/29). The Shiller P/E ratio rose from 17.82 in 9/1927 to 32.56 in 9/1929. Note that it was below 10 in 7/1925. The DJIA tells a similar story. The DJIA peaked at 381.17 on 9/3/1929. It was only 240.24 on 9/4/1928 and 191.26 on 9/3/1927. Note that the DJIA was just below 100 on 7/25/1925. The fantastic rise in stock prices and P/E ratios was not matched by a comparable growth in corporate earnings. Earnings in 9/1929 ($1.55) were only slightly higher than 12/1916 ($1.53). Of course, earnings in 1916 were inflated by WWI. However, earnings were around $0.90 after WWI and exceeded a dollar in 1925. No reserve currency has lasted more than a few hundred years (at most). Moreover, reserve currency status and overall economic power can’t be separated. The dollar became the reserve currency of the world because the U.S. had the largest economy. Yes, there was a rather long lag separating U.S. economic dominance (greatest GDP) which started in the 1870s and reserve currency status (beginning in the 1920s). However, the linkage is pretty clear. It is also true that reserve currency status is also associated with capital exports, not gigantic debts and deficits (trade, budget, etc.). The EU and China now exceed the U.S. in total GDP. India will pass the U.S. economically eventually (decades). Is it really plausible that the 4th largest economy in the world will still have the dominant reserve currency in 50 years? At present, China’s economy is too closed and the EU is too unstable for the RMB or Euro to become dominant reserve currencies any time soon. However, both conditions could change. Beyond that, the U.S. isn’t a model of sober economic management. The dollar became a reserve currency back when the U.S. had very conservative attitudes towards debt, deficits, trade, etc. See “America’s Fiscal Constitution: Its Triumph and Collapse” for a book on the subject (written by a Democrat). Historically America took considerable pains to protect the strength of its domestic economy. Now we have a dominant ideology of “free trade” that extolls outsourcing and “hollowing out” as virtuous (and ignores that inevitable consequences of debt proliferation). That’s not a formula for maintaining a reserve currency over the long term. As I stated earlier, this is a very good article. I would like to add one more data point, as to evils of the gold standard. Japan in late 1920 and in the 1930s is a case study in how gold (and the ideology of the gold standard) can lead a nation astray. The proponents of gold In Japan were liberal internationalists. They destroyed their own country with their economic theories, but they were also (no joke) liberals, free traders, democrats, and advocates of world peace. The tragic life and death of Junnosuke Inoue exemplifies his class. In 1929, as Minister of Finance he put Japan back on gold. In 1931 he was murdered in the League of Blood Incident. Their opponents were right-wing fanatical militarists. They brought down the liberal order in Japan with a war of assassination. They pushed Japan off gold and enabled very substantial economic growth in the 1930s. They also plunged Japan into unwinnable wars that led inexorably to Hiroshima. I’m afraid this post really is too bent on blaming the gold standard for everything and the kitchen sink and unreasobly dismissive of the large 1920s credit bubble, which was in corporate debt and margin credit. Of course tightening set off the crisis, and also in 2007. Tightening precedes most recessions. Tightening is part of the credit cycle, and happens even when there is no central bank. Usually when the reaction to tightening is severe that’s taken as evidence that the central bank tightened too late after too many vulnerabilities had proliferated. Unless your argument is that central banks should abolish all tightening forever, I don’t really see what point you’re making about the Fed in 29. I think the gold standard had its upsides and downsides. I don’t see the point in getting all riled up over whether it was great or terrible. It won’t ever come back anyway, There’s a whole lot more interesting to the economic history of the gold standard era than the gold standard. And I just don’t see how anyone will ever know whether things would have gone better or worse without it. But the spirit of the gold standard lives on in the euro. The common thread is that people just like having a common standard, and they like the idea that the standard will be solid and predictable and rule-based, even if they somehow never quite manage that. No doubt, you see some of the same problems with the euro that the gold standard had. It sounds great until you’ve slid on the fiscal restraints for too long to restore them without a lot of pain. And yet overall Europeans prefer it over the past and won’t give it up. Lewis, Thanks. What serves as a reserve currency is largely the outcome of a path-dependent historical process. Like it or not, barring some cataclysm, the US is stuck with being the supplier of the world’s reserve currency. If we are smart – and our track record hardly entitles us to have a high estimate of our intelligence – we will reconcile ourselves to the role history has provided us and not try to undo what can’t be undone. I am not Friedman’s biggest fan, but I totally agree with him about the folly of digging gold out of the ground to put in central bank vaults. Auburn, Debt levels in 1930 don’t look like they are that much higher than in 1920. 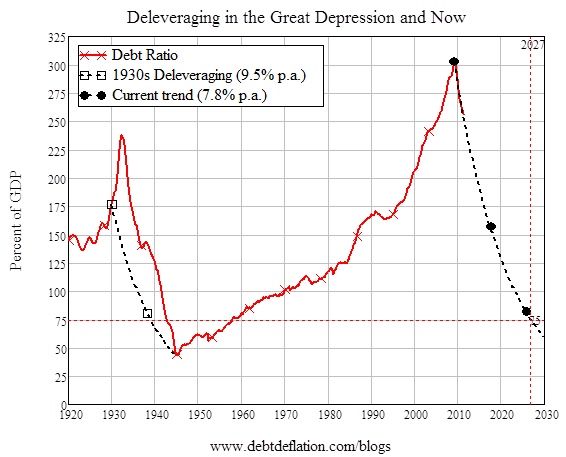 Debt levels skyrocketed after 1930 as a result of the deflation. So it was the deflation that caused debt to be excessive not excessive debt that caused the deflation. Benjamin, Gold is a great decoration, but way over-priced. Neil, It is possible to save and accumulate wealth over time. People who accumulate wealth by saving (not consuming) tend to get rich, if they buy assets that generate a decent rate of return. I don’t think that gold is a particularly good asset to hold, even though sometimes it does appreciated rapidly. If you can get the timing right, you can make a killing. Otherwise, it’s a bad investment. JMRJ, Law and economics are not mutually exclusive. Natural law does not exist independently of the moral arguments that can be made on behalf of those claims. People have argued that slavery is ordained by natural law and that it violates natural law. Natural law is simply a way of appealing to some external authority, but the only authority out there is the argument you can make on behalf of whatever position you are arguing for. My claim about the dollar remaining the world’s reserve currency for at least a millennium was just my way of saying that there is nothing on the horizon that will displace the dollar from its current position. Peter, The increase in stock prices in 1928-29 was anticipating the growth of earnings that would have taken place had there not been a catastrophic deflation and depression. The 1920s and 1930s was an era of rapid a technological progress and a huge increase in productivity. I don’t say that there was not some overpricing of stocks, but there was plenty of justification for stock prices to rise. About the reserve status of the dollar, see my comment to JMRJ. Your projections about the Chinese and Indian economies are merely projections. The point about being a reserve currency is that there are huge switching costs associated with switching from one currency to another. Those switching costs might be borne if there were an international government capable of requiring everybody switch from one currency to another, but in the absence of a deliberate agreement by everyone to switch, there would be no reason for anyone to bear those costs without an expectation that everyone else would bear those costs as well. Tom, I didn’t blame the ebola virus on the gold standard, so it’s not accurate to say that I blame the gold standard for everything. The Great Depression was not in any way a typical business cycle downturn, so to say that there is some tightening in every credit cycle is to misunderstand completely the chain of events that led to the Great Depression. Have a look at my posts on Hawtrey and Cassel. The gold standard as a system developed in the middle of the XIX century. The emergence of this system was due to the need to establish trade settlements between industrial capitals of major countries.